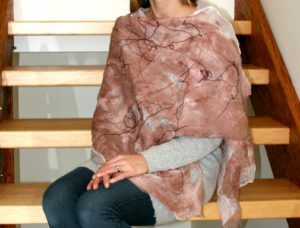 In this one day workshop you will complete a nuno felted scarf. Nuno felting refers to blending wool roving and fabrics together into one fabric through a rolling process. The technique used will embed wool, prefelts and other fibers into a silk scarf. Note: Felting requires repetitive motion and some strength in arms, hands & wrists. No experience necessary. Students to bring: 2 medium or large towels, metal mixing bowl, measuring cup, apron and a piece of bubble wrap that measures 36″ X 60″ or so. You will get wet! Price includes all other materials.